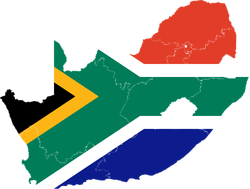 South Africa is most commonly known as "The Rainbow Nation". With the father of the nation being, Nelson Rolihlahla Mandela. Up until the 1994, South Africa's beauty was shrouded by the cloak of Apartheid. This was brought to an end by ex-president FW De Klerk. Coupled with this, seen the release of Nelson Mandela, from Robin Island. Ever since then, South Africa has been on a path of success. More and more visitors visit our great land each year. In 2010, the number of visitors increase to 11.5 million foreigners. This comes to no surprise with highlights such as Cape Town, Robben Island, Table Mountain (One of the 7 wonders), The Winelands, The Garden Route, Wildcoast, Durban, The Elephant Coast, The Drakensberg, Johannesburg (City of Gold), Soweto, Maropeng (The Cradle of Humankind), Kruger National Park and the Blyde River Canyon Nature Reserve.